Hi friends! 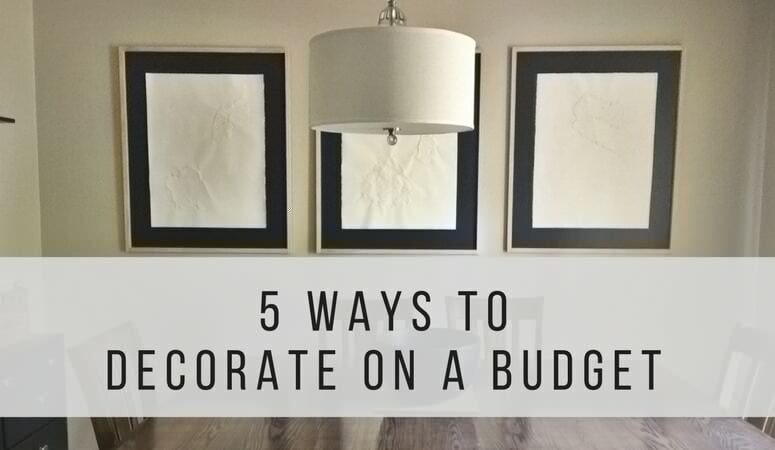 I’m so excited to be back sharing some more decorating ideas with you all! I’m Nicole and I blog over at Birkley Lane Interiors where I help women solve their decorating problems. I recently shared some of my favorite Fixer Upper style throw pillows that were to die for! If you missed it, definitely be sure to check them out 🙂 You can do that here! 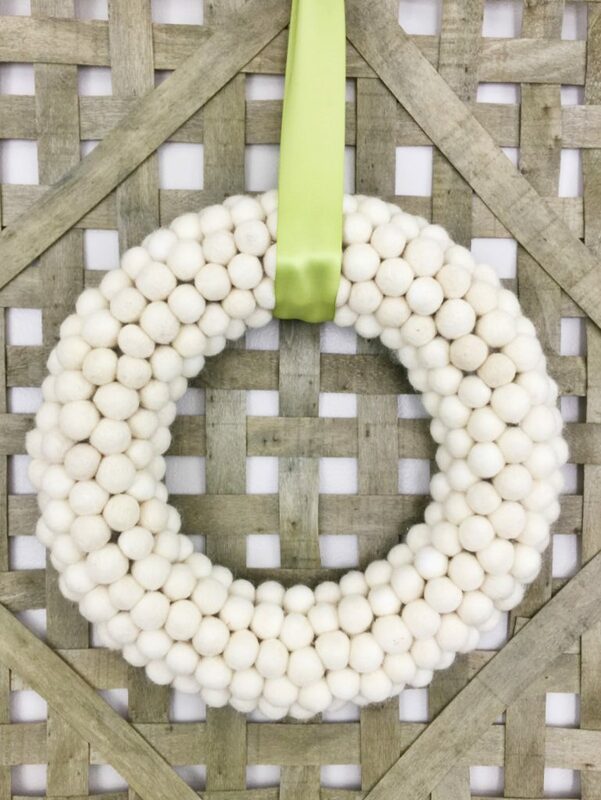 Well, today I’m here to share another great accent piece for your home: a super fun and darling pom pom wreath DIY! 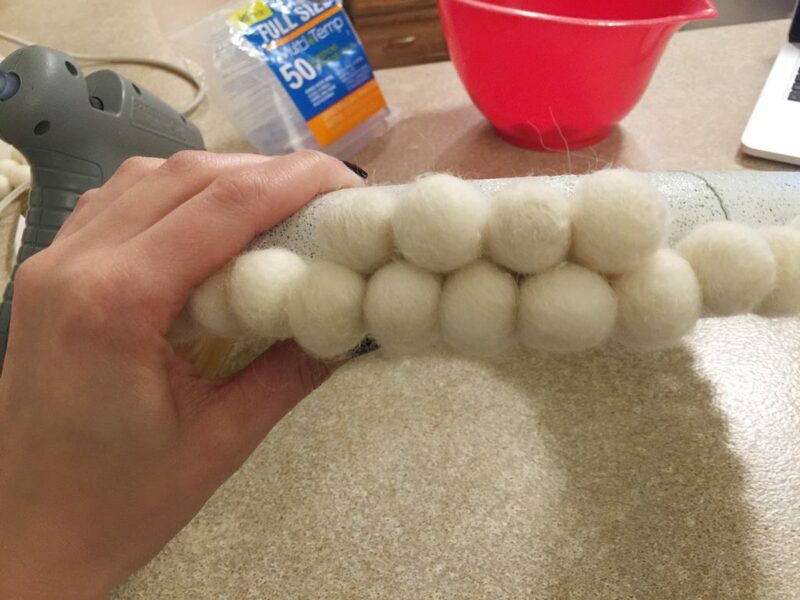 Is anybody else here in love with pom pom crafts? (Please say that it’s not just me, haha!) I recently made a pom pom garland and I love what a fun accent piece it is in my home! Pom poms are great because they not only add color, but they add texture and depth to any room! I especially love the look of felt pom pom balls. I think they have a more sophisticated and clean look that adds major style! 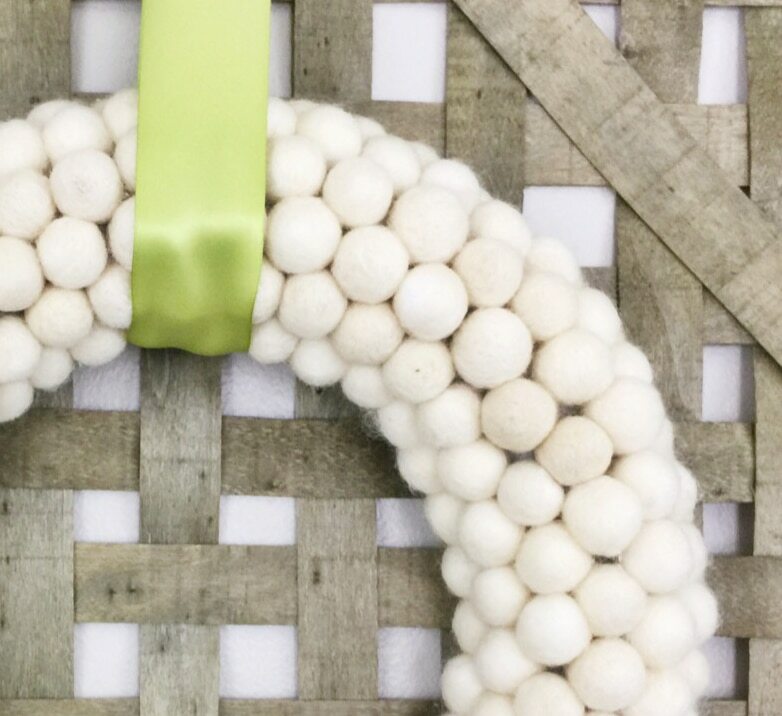 We all love the Fixer Upper farmhouse look, and so for this pom pom wreath DIY I chose a nice, white or cream pom pom. This color is perfect, because first of all, it’s a great farmhouse color, and second of all, it can now become a great accent piece for any season of the year! Christmas, Winter, Fall, Spring or Summer—simply change out the color of your ribbon and you are set for the holiday! Easiness! 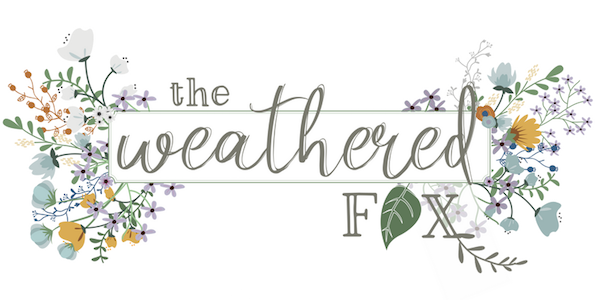 If you’re looking for another great DIY farmhouse wreath, be sure to check out this farmhouse lavender wreath! 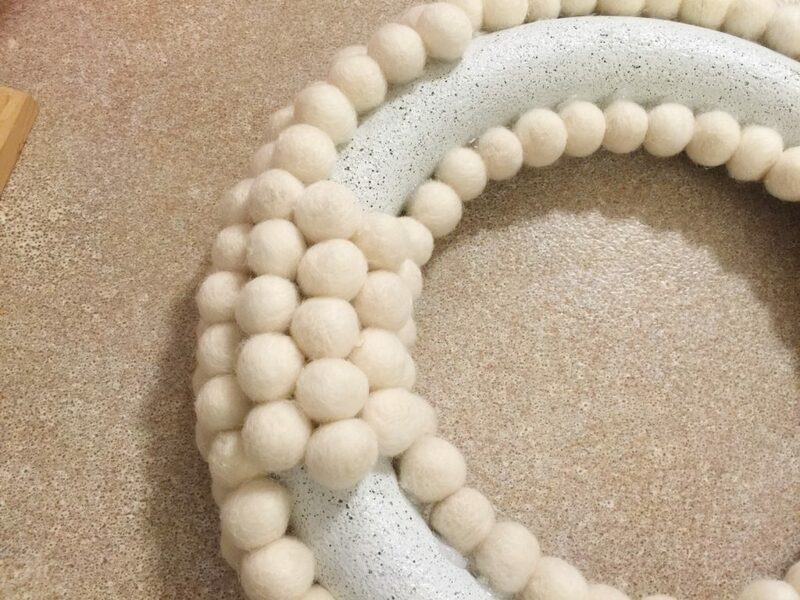 White foam wreath. I would suggest getting a 10 inch wreath or smaller. Ribbon. I used this beautiful sage color—it’s all the rage this year! And perfect for St. Patrick’s Day, which is coming up! The first thing you want to do is make sure that your wreath is white. I had a green one, so I spray painted it white first! 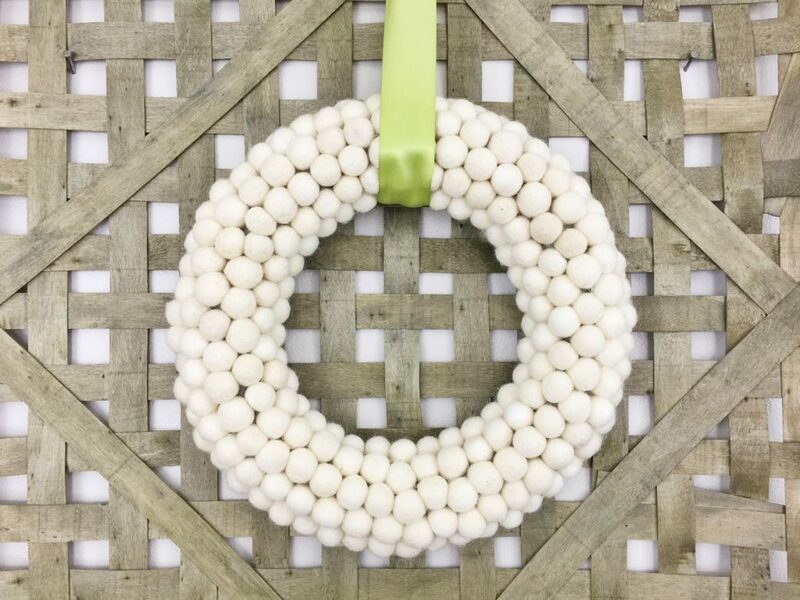 Save yourself a step and start out with a white wreath! Once your wreath is ready, lay it on a flat surface that you can use a glue gun on. (I wouldn’t suggest carpet, haha!) I just had mine on the kitchen counter. 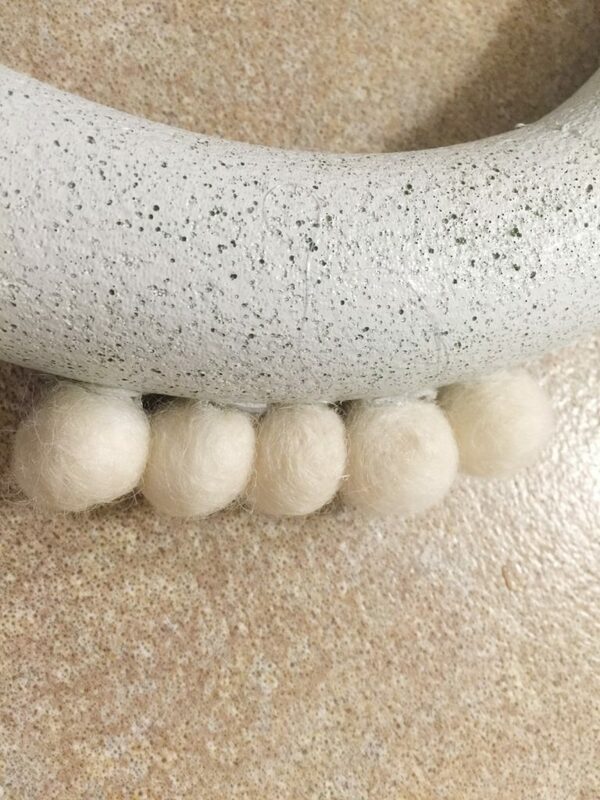 You’ll then start glueing your felt pom pom balls on the wreath: begin with the bottom, outside layer. 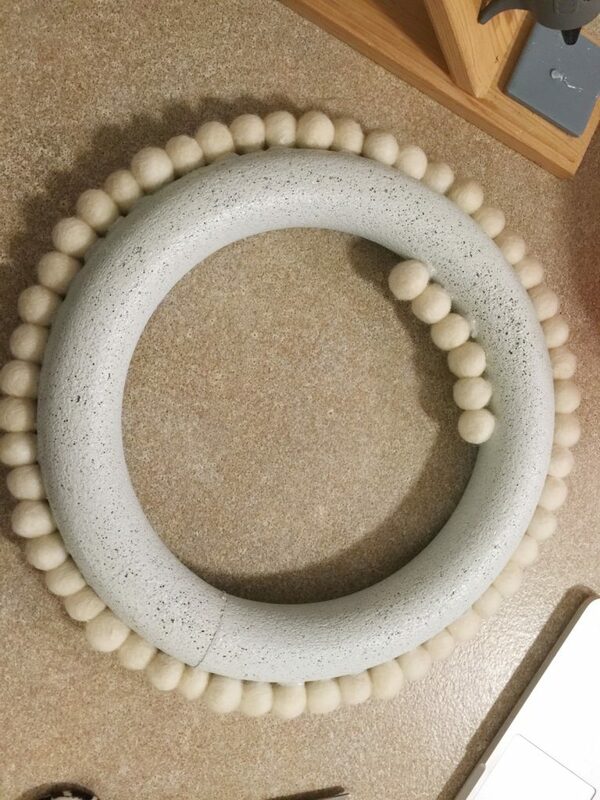 I kept my wreath on the counter while I glued so I could see how the wreath would lay flat when it was on a wall or door; then I glued the ball on. You don’t need the balls all the way around the wreath, just on the front and sides! When you’ve completed the bottom outside row, then glue the bottom inside row. When that’s done, start filling in the rest of the wreath! Again, try to fit the felt pom pom balls snugly together. Once the wreath is completed, add your ribbon and you are done! How easy is this pom pom wreath diy?? It’s the perfect craft to do while binging on your favorite Netflix show, am I right? 😉 I love my wreath and the great farmhouse accent piece that it is! 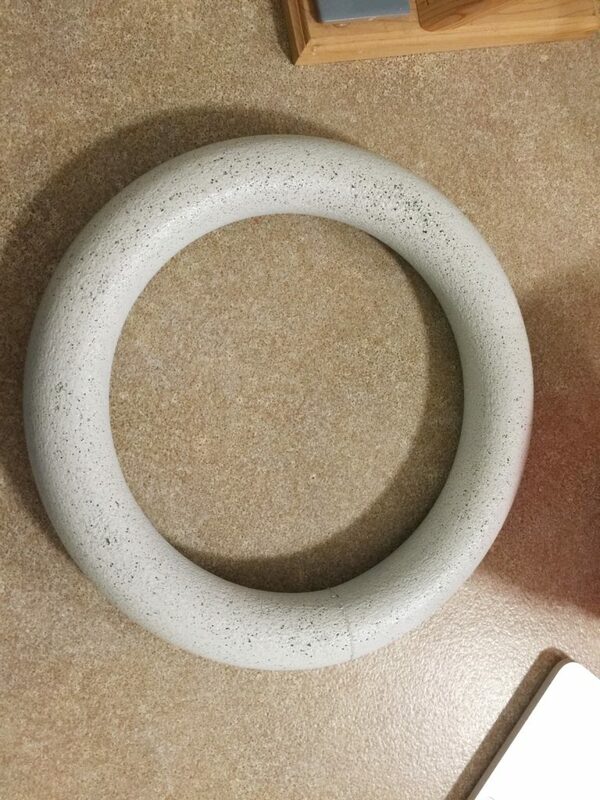 In fact, it would look amazing above a mantle with these darling farmhouse style DIY candle holders. Happy decorating friends! I’ll be back soon with more fun, farmhouse decorating ideas! 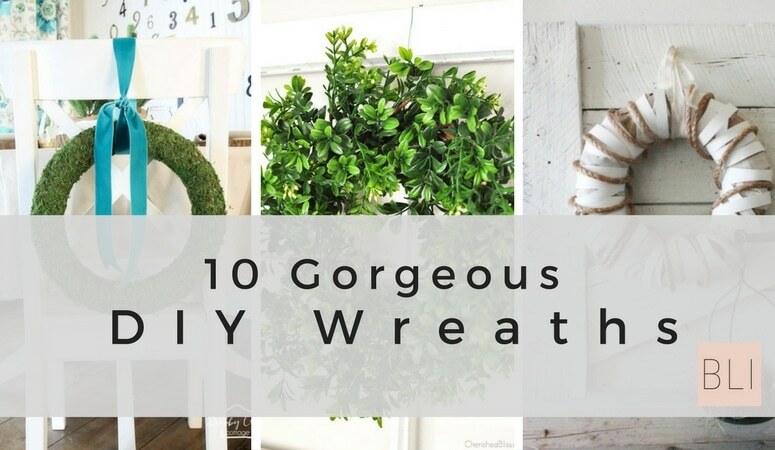 If you liked this post, you’ll also love my posts on 10 Gorgeous DIY Wreaths and 5 Ways to Decorate on a Budget!